The central conveyor belt brings the bottle from the capping machine conveyor. These bottles are automatically bifurcated on the two adjoining conveyor belts & further on the side tables for operators sitting on either side of the table. 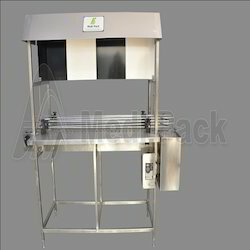 The operators in turn pick up the bottles & visually inspect the bottles in the alternate white & black background to check for any particles in the liquid filled, sealed & breakage of bottle. After inspection the bottles are placed in the central track, which is transfer for labeling. 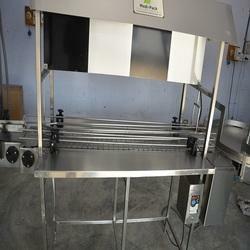 We are a noteworthy company, engaged in providing a comprehensive collection of Inspection Machine With B-W Back. 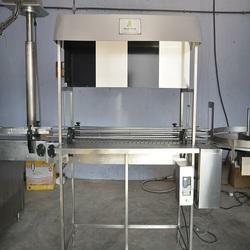 Our machine comes with multi-track conveyor support with hood support as well as lighting provision for conducting of visual inspections. This machine has gained huge demand in the industry due to its featured like A/c frequency variable drive, direct gear drive, adjustable height of conveyor belt, self-alignment bearing for easy maintenance. The central conveyor belt brings the bottle from the capping machine conveyor. These bottles are automatically bifurcated on the two adjoining conveyor belts & further on the side tables for operators sitting on either side of the table. The operators in turn pick up the bottles & visually inspect the bottles in the alternate white & black background to check for any particles in the liquid filled, sealed & breakage of bottleA. After inspection the bottles are placed in the central track, which is transfer for labeling.